The Lunar Society is one of our big and wonderful long-term plans to encourage homeschoolers to participate in real online research projects and share their results with other homeschool families. On the eBird website (eBird.org), sponsored by Cornell University, I’ve been tracking the birds in a small riverside park near me (eBird hotspot L6926932), and as of this week I’ve contributed a total of 439 checklists (daily observation reports) for this locality. When all the checklists are combined you can really get a sense of the seasonal distribution and migration patterns for the year. Seasonal summary for a number of local species as of late March 2019. ❡ The friends who made the future: Learn more about the original Lunar Society of Birmingham in “The Lunar Men,” a fine short video from History West Midlands. The Wikimedia Commons Photo Challenge encourages people to take and submit high-quality images for the public Wikimedia Commons database — the source from which most of the images in Wikipedia are drawn. Once you’ve registered and submitted an entry, you can also participate in the voting for the best entries each month. If you have talented young photographers in your home academy, why not encourage them to enter. Working on a specific theme over a period of a few weeks is a great way for students to develop both their technical camera skills and their visual artistic skills. You can find more ideas for independent student projects in a wide range of scientific and scholarly fields on our River Houses Lunar Society page (riverhouses.org/lunar-society). 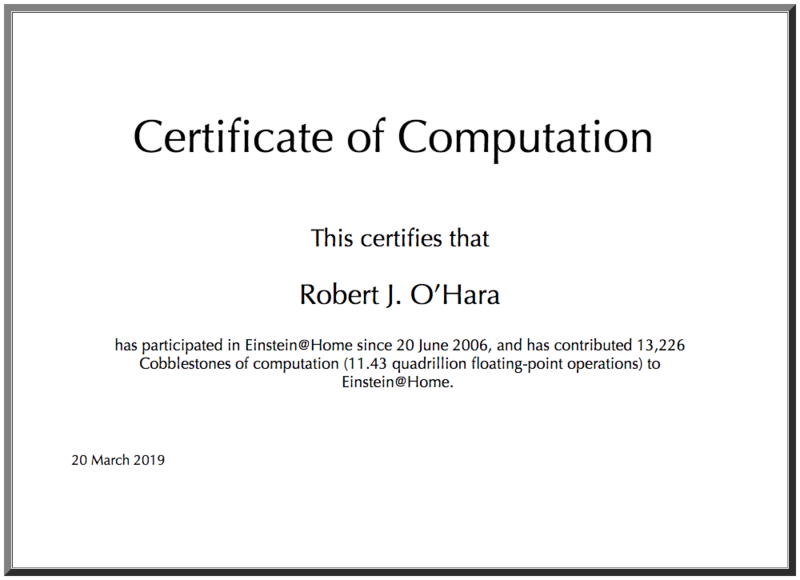 The project is called Einstein@Home (einsteinathome.org) and it is sponsored and funded by the University of Wisconsin, the U.S. National Science Foundation, and many other scientific organizations. I’ve been participating for years, and you can too with just a few minutes of set-up. The application you download is called BOINC — the Berkeley Open Infrastructure for Network Computing application — and it was developed at the University of California to support “distributed computing” research projects like Einstein@Home. (I believe there is also an Android version that may work on your phone, but I haven’t tried that; you’ll have to experiment.) Once you download and install the BOINC application, just select Einstein@Home from among the available projects, and you’ll be up and running. Once the application is up and running, Einstein@Home will produce a lovely screensaver when your computer is idle that shows a map of the heavens, the locations of the radio-signal detectors, and where in space the recording came from that your computer is currently analyzing. Einstein@Home screensaver from RJO’s computer, showing the location in space that was being analyzed (crossed circle, top center) at the moment this screenshot was taken. 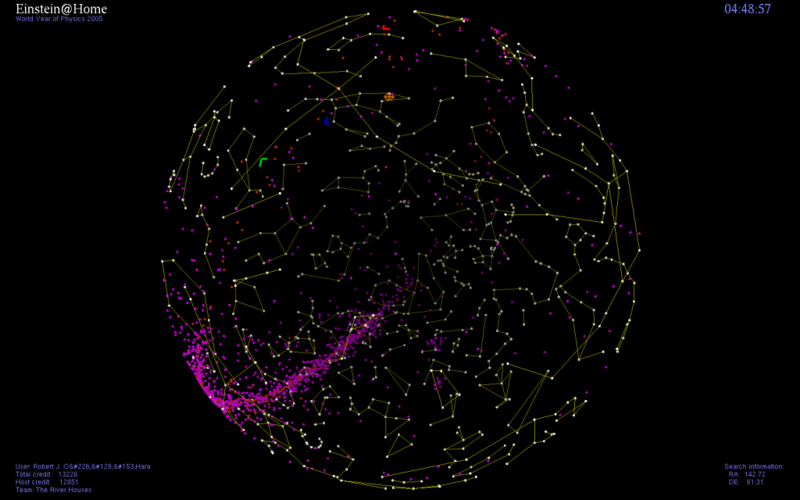 The purple dots represent known pulsars. More that 500,000 volunteers (just like you) have participated in the Einstein@Home project, and more than 40 new pulsars have thus far been discovered. The Internet provides exceptional opportunities for homeschool students to participate in real research projects in a variety of scientific and scholarly fields, something that would have been impossible only a few years ago. Pay a visit to our Lunar Society page to read about many more projects, in addition to Einstein@Home, that you and your family can join. Tonight is the night of the full moon, and that means it’s time for a report from the River Houses Lunar Society. On the eBird site (eBird.org), sponsored by Cornell University, I’ve been mainly tracking the birds in a small riverside park near me (eBird hotspot L6926932), and since our last Lunar Society report I’ve added 27 new checklists (daily observation reports), bringing my eBird total to 335. 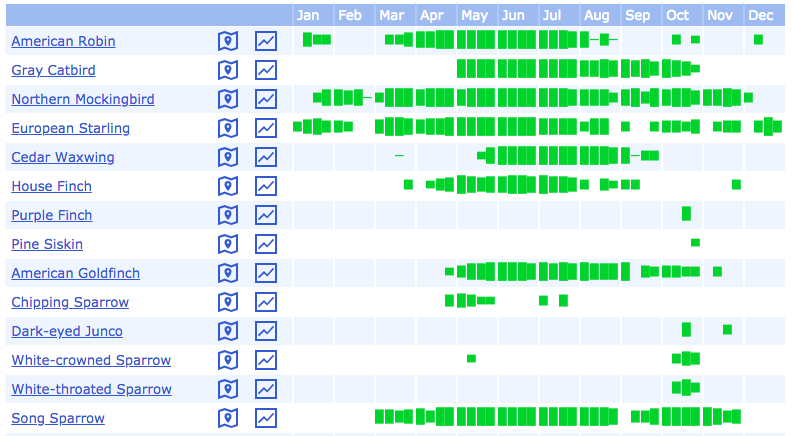 When all the checklists are combined you can really see the seasonal distribution and migration chart for the year develop. You can start keeping a similar list for a location near you — your backyard, or a local park or other natural area. (Helping to track a local park or eBird “hotspot” will let you generate more interesting results.) You can even add photos and sound recordings to your reports if you wish. Just pay a visit to the eBird website (ebird.org) and start exploring. The SETI@Home project (setiathome.ssl.berkeley.edu), sponsored by the University of California, uses idle time on your computer to perform complex calculations on radio telescope data, looking for extraterrestrial signals. (Really!) I’ve been participating in this project with my computers for a long time and I recently created a River Houses team page for future development. Once your computer is signed up to participate, you can print “certificates of computation” that shows how much data you’ve individually analyzed and how much your team has analyzed. And here’s another level of skill development for your high-school (or even advanced middle-school) students: once you have a few weeks or months of data, you can start graphing your contributions. 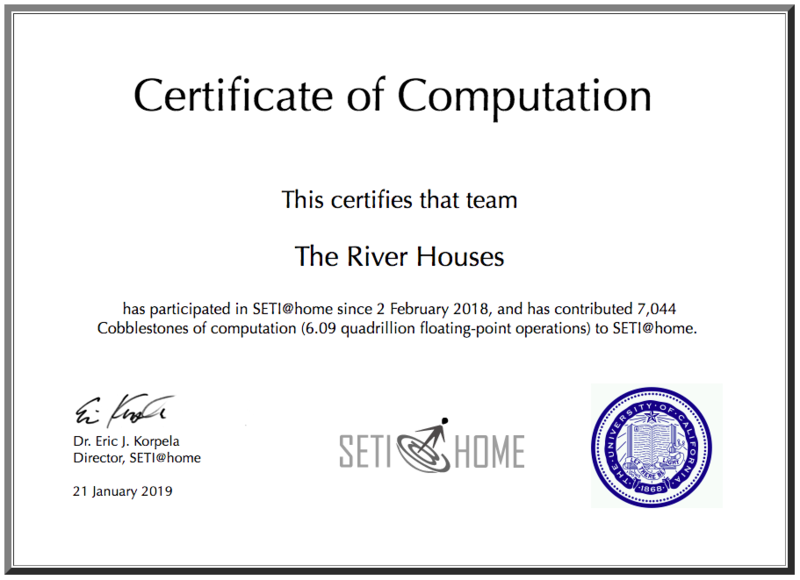 Using Google Sheets, I’m setting up a simple interactive chart of the current SETI contributions for the River Houses team. It’s just a test at the moment — something that we can refine, develop, and expand in the future. The Internet provides exceptional opportunities for homeschool students to participate in real research projects like these in a variety of scientific and scholarly fields, something that would have been impossible only a few years ago. Pay a visit to our Lunar Society page to see many more projects your family can join. 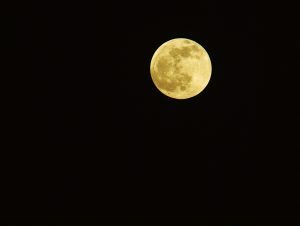 Tonight is the night of the full moon, and that means it’s time for a report from the Lunar Society of the River Houses. On the eBird site (eBird.org), sponsored by Cornell University, I’ve been tracking the birds in a small riverside park near me (ebird.org/hotspot/L6926932) and over the past month I’ve added 30 new checklists (daily observation reports), bringing my eBird total to 448. Here’s today’s list as an example: ebird.org/view/checklist/S50161311. When all the checklists are combined you can really see the distribution and migration chart for the year develop, with fall migration and spring migration pulses visible for a number of local species. Bird records for Riverfront Park in Fitchburg, Massachusetts, as compiled by eBird. You can see the fall migration appearance of White-crowned and White-throated Sparrows, two species that are generally absent at other times of year. Baltimore Orioles and Red-winged Blackbirds, by contrast, appear only sporadically in the spring. You can start keeping a similar list for a location near you — your backyard, or a local park or other natural area. Just pay a visit to the eBird site (ebird.org) and start exploring. 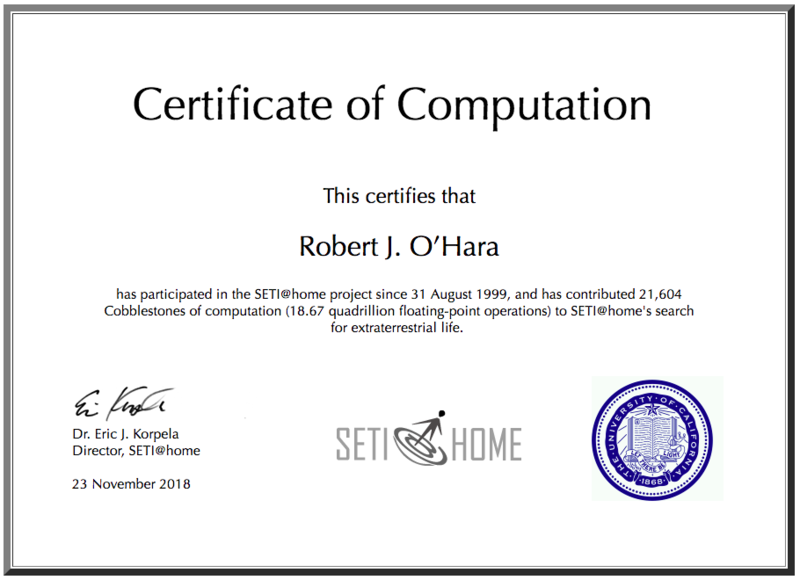 The SETI@Home project (setiathome.ssl.berkeley.edu), sponsored by the University of California, uses idle time on your computer to perform complex calculations on radio telescope data, looking for extraterrestrial signals. (Really!) I’ve been participating in this project with my computers for a long time and I recently created a River Houses team page for future use (setiathome.berkeley.edu/team_display.php?teamid=208851). Once your computer is signed up to participate, you can print a “certificate of computation” that shows how much data you’ve analyzed. The Internet provides exceptional opportunities for homeschool students to participate in real research projects like these in a variety of scientific and scholarly fields, something that would have been impossible only a few years ago. Pay a visit to our Lunar Society page (riverhouses.org/lunar-society) to see many more projects that your family can join. Here’s an outstanding new research opportunity for homeschool students from the Library of Congress. The Library of Congress is inviting volunteer researchers (that means you and your homeschool students) to help transcribe important historical manuscripts, documents, and records so they will be more accessible in digital form. Interested in the pioneering nurse Clara Barton? Or maybe Mary Church Terrell and the founding of the NAACP? Or perhaps letters written to Abraham Lincoln. We always recommend bird study as a great homeschool science activity — it’s suitable for all ages and for all seasons of the year, and it can be made as elementary or as advanced as you wish. But what if birds don’t catch your student’s interest, or what if you’re stuck inside from bad weather or illness, or what if you want to travel farther afield than your own local neighborhood? Let online research come to your rescue! 📍Manatee Chat (zooniverse.org) — Identification and classification of manatee calls. 📍Nebraska Wildlife Watch (zooniverse.org) — Help the Nebraska Game and Parks Commission identify species in camera trap images. 📍Reading Nature’s Library (zooniverse.org) — Help the Manchester Museum discover the treasures in its collection. 📍South Sudan DiversityCam (zooniverse.org) — South Sudan, the newest nation in the world, is extraordinarily biodiverse. Help us conserve wildlife in this special and under-studied region by identifying animals in camera trap photos. 📍Tag Our Trees (zooniverse.org) — Help us identify plant features while learning about botany and exploring the Arnold Arboretum’s Living Collection. On the eBird site (eBird.org), sponsored by Cornell University, I’ve been tracking the birds in a small riverside park near me (ebird.org/hotspot/L6926932) and over the past month I’ve found six new species there: White-throated Sparrow, Ruby-crowned Kinglet, Yellow-rumped Warbler, Purple Finch, and Pine Siskin. That brings the park total to 73. These aren’t rare species in the region, but they haven’t been recorded before in this small local park, and my cumulative list illustrates how many birds you can find even in your own neighborhood and what their regional migratory patterns look like. SETI@Home computation report for the River Houses team (currently just me), 24 October 2018. 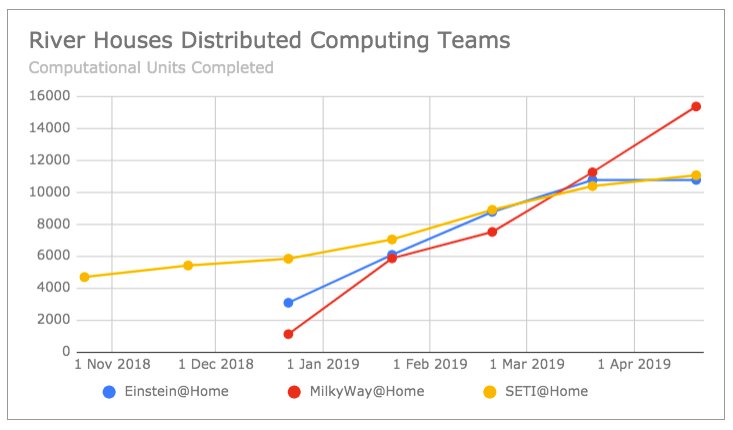 I recently joined another computer-based project called MilkyWay@Home (milkyway.cs.rpi.edu), sponsored by Rensselaer Polytechnic Institute, that studies the structure and history of our galaxy. Just getting started there, so no results are available yet. Tonight is the night of the full moon, and this post is just a preliminary note on something I’m thinking about for the future. One way to bring people together is to give them projects they can work on jointly over a long period of time. They don’t have to be face-to-face projects — in the Internet age, there are many wonderful online projects that people can join and work on collaboratively. And working on joint projects is a valuable educational experience for students of all ages. 🌌 Einstein@Home (einsteinathome.org) — A project to search for gravitational waves and pulsars in deep space. 🦆 eBird (ebird.org) — A project to map bird observations in your homeschool backyard and around the world. 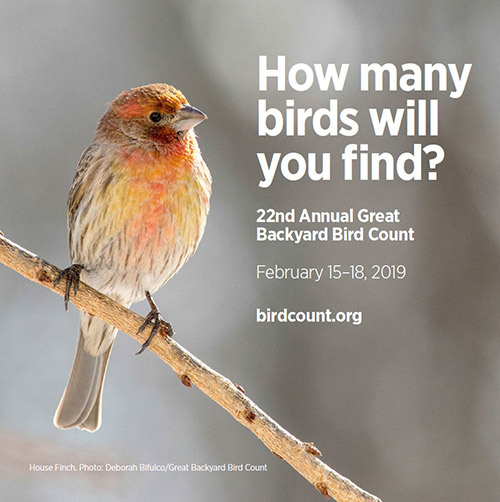 Of these initial three, the eBird project is suitable for people of all ages — even small children can join in the count of birds at the backyard feeder. The other two are more advanced, suitable for high school students interested in computers, science, and astronomy (and their parents, too, of course). Many of the other group projects I have in mind will cater to middle and high school aged students as well. You can join any of the above three projects yourself right now, as an independent participant, if you wish. I’ve had my own computer signed up to work on the SETI@Home project for a long time, and I’ve recently created a River Houses team page (#208851) for future use. There isn’t much there at this point, and it’s not especially well designed from the point of view of a beginning student, but it’s a starting point from which to grow. What does this have to do with the full moon? Well, there was a famous science-and-technology club in England in the late 1700s and early 1800s called the Lunar Society (because they met each month around the time of the full moon). They discussed current scientific developments, shared new research results, talked about new inventions, and generally had a grand old time. I’m hoping that within the River Houses, we’ll be able to get homeschoolers participating in a number of these group research projects, and once a month (you know which day), we can have a kind of round-up of the things people have done. Imagine hundreds (thousands?) of homeschoolers across the country learning about and contributing to interesting research projects with their River House neighbors.